If you regularly read our blog posts, you know that, in addition to writing about topics that are helpful for owners and fans of Revere Ware cookware, we also like to write about our experience running an online business. Today’s topic is Google Adwords, something which is pretty essential for running almost any online business. If you don’t get traffic, you can’t make sales. Let’s start with this graph that shows the average cost per click we’ve paid since we started the business, about 8 years worth of clicks. 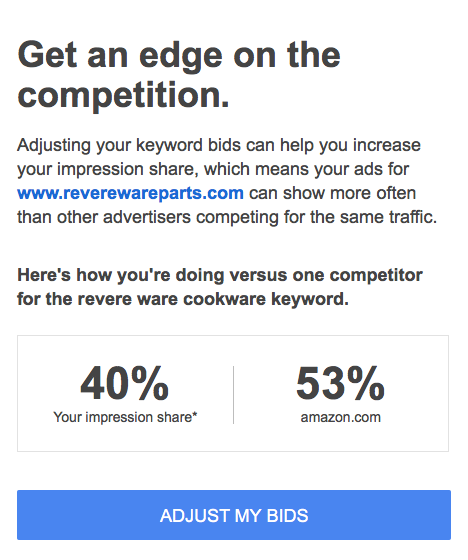 One thing to realize is that, when it comes to most of the keywords we advertise for, like “revere ware parts” or “revere ware handle” we are the only business providing these parts. You might think that there is little to no competition for the Adwords phrases we pay for, and you would be right. By any standard, the amount we pay per click is tiny. Some businesses will pay tens or hundreds of dollars for a single click, while we spend mere pennies. How is this possible given that we are the only business that does what we do? Well, we recently discovered the likely reason. Check out this email we recently got from Google. Well that’s interesting, we are mostly competing with Amazon.com for keyword phrases. The strange thing about this is that, well, we are the ones selling our parts on Amazon.com. So, it appears that Amazon.com, in order to move more of the business for our parts to their website rather than to ours, is purchasing the same phrases as us. What does this mean to our business? At one level, not much. Our net margins of selling through our own website and using a fulfillment center to ship the orders, versus selling on Amazon.com and using Fulfillment by Amazon to fulfill the orders is about the same. Well, mostly. Take a look at the graph of our margins over the last 13 months. As you can see, our website margins (in blue) are right in line with the Amazon margins (in red), except for the last two months. Our fulfillment service has a certain fixed cost for using the service (base cost that doesn’t change every month) and then a variable cost per order (handling, packaging materials, postage). If our website sales get too low in any month (in the summer months we do about half the volume per month than in the winter months) then there aren’t enough order such that the shipping charges sufficiently offset the fixed costs. This affect is smaller if you consider the full year, but, if the proportion of our sales that are sold through Amazon.com continues to go up, eventually it simply won’t be profitable for us to sell through our own website anymore; we will at some point start losing money on every order. Selling through our own website is beneficial, as it allows us to keep much more in touch with our customers, and get direct feedback from them, than selling through Amazon.com, so that would be a shame.